When your controller is first powered on, it will run a short wizard to connect your controller to your wireless router. If you’re not using the initial startup wizard then go to the section Viewing Wireless Settings to change your wireless settings. 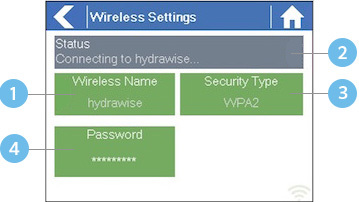 NOTE: If your network is not listed then check that the unit is within wireless range. 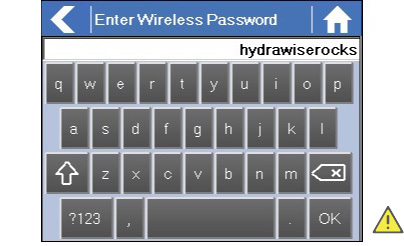 NOTE: Make sure you press the OK button after you’ve entered your password. Pressing the Home or Back buttons will not save your changes. When connecting to your wireless, the WiFi Icon at the bottom right of the controller screen will flash. Connection takes about 30 seconds and when successfully connected the WiFi Icon will stop flashing and stay on.